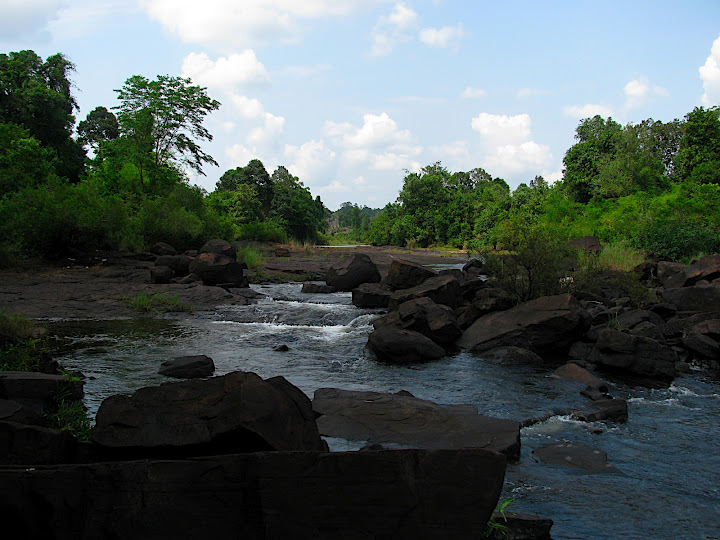 Chi Phat is a single-dirt-road town nestled in the Cardamom Mountains of Southwestern Cambodia, one of the largest intact forests in Southeast Asia. 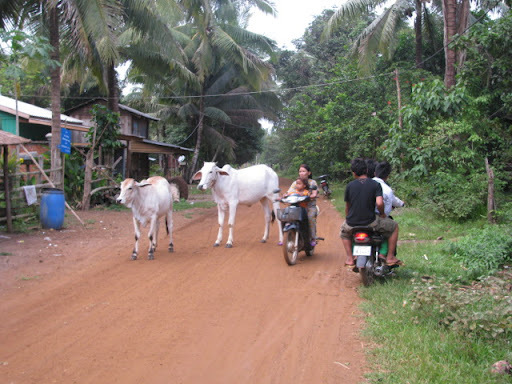 The town is only accessible by two routes: a three-hour river boat trip up the Phipot River or, if the road isn’t flooded by the rainy season, an exhilarating 30-minute motorbike ride from Andoung Tuek, a blip on the one paved road that runs along Cambodia’s southwestern border. Since 2007, Wildlife Alliance has been running an ecotourism project in Chi Phat (full disclosure: I used to work for Wildlife Alliance in Washington, DC). The project has been featured in The New York Times and since its inclusion in the Lonely Planet travel guide, has become a destination for backpackers looking to leave the beaten path. I recently visited the project after spending time in neighboring Vietnam and was struck by the contrast between the densely populated and urbanized Mekong Delta and the visibility of rural poverty in Cambodia. “Cambodia’s contemporary poverty is largely a legacy of over twenty years of political conflict,” reads a 2006 World Bank Poverty Assessment. The Pol Pot regime’s agrarian collectivization forced millions into the countryside and as a result, even in today’s predominantly-urban world, Cambodia remains 78 percent rural. Today 93 percent of Cambodia’s poor live in rural areas, two thirds of rural people face food shortages, and maternal and reproductive health outcomes in the country lag far behind those in the cities. Chi Phat and the sparsely populated northeast have over ten or twenty times the rate of maternal deaths of Phnom Penh. Before Wildlife Alliance began the Community-Based Ecotourism (CBET) project in Chi Phat, most villagers made a living by slash-and-burn farming, illegal logging, and poaching endangered wildlife. Wildlife Alliance Founder and CEO Suwanna Gauntlett described the ecological zone around the town as “a circle of death,” in an audio interview with New Security Beat last year. 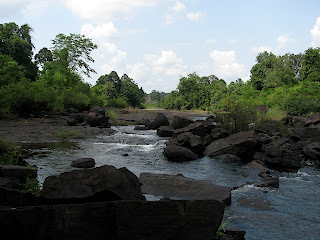 Now, Chi Phat is a rapidly growing tourism destination offering treks and bike tours. In 2010 they brought in 1,228 tourists – not huge by any means, but over twice the number from 2009. The town now boasts a micro-credit association, a school, and a health clinic that offers maternal and reproductive health services. The village is also visited by the Kouprey Express, an environmental education-mobile that provides children and teachers with lessons, trainings, and materials on habitat and wildlife protection, pollution prevention, sustainable livelihoods, water quality, waste and sanitation, energy use, climate change, and adaptation. Since I have started working with CBET, I realize that the wildlife and forest can attract a lot of tourists and bring a lot of income to villagers in Chi Phat commune. I feel very regretful for what I have done in the past as the poacher…I know clearly the aim of CBET is to alleviate the poverty of local people in Chi Phat, so I am very happy to see people in Chi Phat have jobs and better livelihoods since the project has established. It’s hard to imagine what the town would have looked like before Wildlife Alliance arrived. The visitor center, restaurant, and “pub” (really, a concrete patio with plastic chairs and a cooler filled with beer), together make up nearly half of the town’s establishments. For two dollars a night, I stayed in a homestay and lived as the locals do on a thin mattress under mosquito netting, with a bucket of cold water by the outhouse for a shower, and a car battery if I wanted to use the fan or light (but not both). 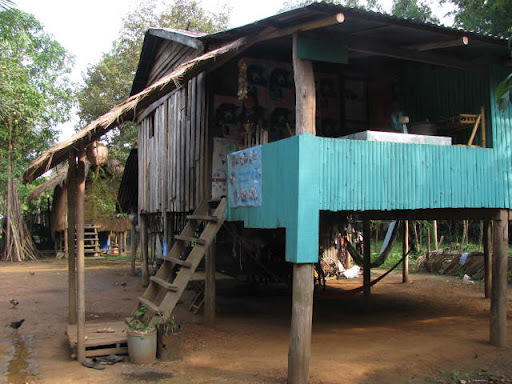 These amenities place Chi Phat above average for rural Cambodia. According to 2008 World Bank data, only 18 percent of rural areas had access to improved sanitation and only 56 percent had access to an improved water source. We monitor closely the impact of the CBET project on the diminution of poaching and deforestation. We estimate that since the beginning of the project, the illegal activities have decreased by almost 70 percent. As Chi Phat ecotourism continues to scale up, de Martimprey expressed hope that more and more villagers would participate in the project and stop destructive livelihoods. After four years, Chi Phat has already developed enough to operate financially on its own. Wildlife Alliance will stop funding the project later this year and transition it towards total self-sustainability. The plan is to then ramp up efforts at a neighboring project in Trapeang Ruong, due to open to the public next month. So far Chi Phat lacks much of what do-gooder tourists are hoping to find when they come in search of ecotourism. There is little to no information about the work of Wildlife Alliance and how ecotourism benefits the town, or the health, education, and economic benefits the villagers have received. A little more obvious justification for ecotourism’s inflated prices might appease the average backpacker used to exploitatively lower prices elsewhere in the country. The guides, staff, and host families for the most part speak little English, which does not bode well for its tourism potential. “This is a work in progress,” said de Martimprey. Most of my time in Chi Phat, I felt like the only foreigner to ever set foot in the town – refreshing after witnessing much of the rest of Southeast Asia’s crowded backpacker scene. As Chi Phat continues to grow, hopefully it will “bring in enough people to support the community without the adverse effects of tourism,” said Zwirn. “They don’t want it to turn into the Galapagos.” Thankfully, de Martimprey told me, “Chi Phat is far from reaching this limit and can be scaled up to much bigger operation,” without negatively impacting the environment. Luckily, plans to build a highly destructive titanium mine near the town were recently nixed by Prime Minister Hun Sen in what was an unexpected victory over industrial interests. However, soon after, the town was again under threat – this time by a proposed banana plantation nearby. “The Cardamom Mountains are still seen as a land of opportunity for economic land concessions for some not-so-green investors looking at buying land for different purposes, and often disregarding the interest of the local people,” said de Martimprey. Sources: BBC, IFAD, Phnom Penh Post, New York Times, United Nations, Wall Street Journal, Wildlife Alliance, World Bank, World Wildlife Fund. I find that Wildlife Alliance's CBET plan will solve alot of health and sanitation issues as well as put an end to the illegal deforestation and destruction in regions of Cambodia less traveled to. Additionally, creating roads that do not hinder the wildlife habitat while still allowing small scale tourist attractions to travel will draw revenue to help build communties like Chi Phat all over the area. My only concern is to what extenet should the Wildlife Alliance carry this project. I feel that such a significant increase could potentially affect the cultural background of these areas, yet if the project is cutting back the number of illegal actions then I find it more beneficial to the state.